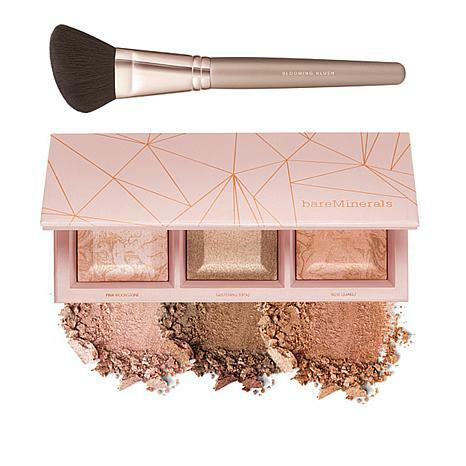 A pretty blush brush and palette featuring a glistening trio of shades inspired by crushed rose quartz crystals to help you create the look of a rose gold glow. Apply with the included brush. 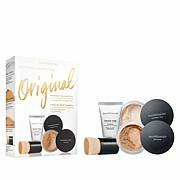 Use dry for a subtle sheer, shimmering veil of second skin color; or wet for a more intense, high impact glow that won't look overdone. 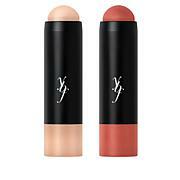 For Fair/Medium skin tones: Apply Glistening Topaz to areas the sun naturally hits. Using light strokes, apply across hairline, bridge of the nose, cheekbones, and jawline. Sweep Pink Moonstone across cheekbones, brow bones, bridge of nose, inner corner of eyes and Cupid's bow. Use Rose Quartz as a blush, just smile and swirl onto the apples of cheeks, then sweep back towards temples. To use as eye shadow, apply Rose Quartz in crease, then Glistening Topaz in the outer V of lid to deepen the color, and Pink Moonstone on the inner lid blending up into the crease. For Tan/Dark skin tones: Apply Glistening Topaz to areas the sun naturally hits. Sweep Rose Quartz along the high points of your face, or anywhere you want to reflect light. Use Pink Moonstone to accent inner corner of eyes, brow bone, bridge of nose, and Cupid's bow. To use as eye shadow, apply Glistening Topaz from eyelid to crease, layer Rose Quartz over it, and apply Pink Moonstone on inner lid and just below brow arch to highlight. I have been in skin care in the makeup industry for years. 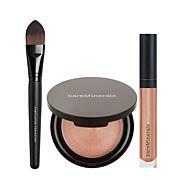 I actually used to demonstrate Bare Minerals products. I love the entire line, the highlighter in this compact is lovely. However the bronzer oh, I'm not happy with and I use one of my bare mineral blushes instead. Still I recommend it good for the skin.